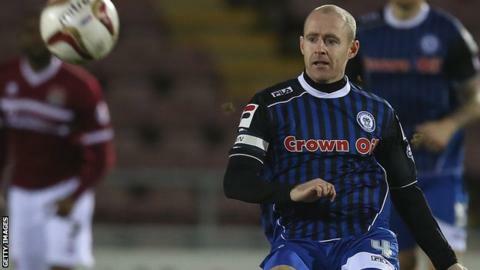 Peter Cavanagh heads a list of six players released by promoted Rochdale. The 32-year-old midfielder has been captain of the club since joining in June 2012 and made 56 appearances. Also leaving Spotland are Godwin Abadaki, Reece Gray, Craig Lynch, George Porter and Robbie Thomson. Goalkeeper Josh Lillis and winger Matty Done have been offered new deals, while manager Keith Hill plans to take up the options on the contracts of Rhys Bennett, Bastien Hery and Joe Rafferty. Striker George Donnelly also has an option on his contract, which is under consideration by both the club and the player. Coaches Brian Barry-Murphy and Steve Collis, who are also out of contract, have been offered new terms. Rochdale finished third in League Two and will play in the third tier next season.